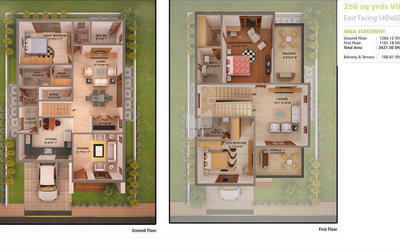 Golden County offers 118 luxury duplex villas built on 15 acre of beautifully landscaped terrain. The villas present you an idyllic blend of countryside living and Metro facilities. They are spacious, functionally designed and built with sophistication. Glittering finish meets greenery where life is a 24x7 celebration. It's a home that offers you an experience that is exclusively yours, located at Velemala, near Tellapur, it has an excellent infrastructure. With National Highways close and the Outer Ring Road passing by, Golden County is an ideal investment. Far away from the hustle bustle of city life, providing you with a calm and serene living, Golden County presents you a new way of green living. This unique eco-friendly habitat is designed as per IGBC norms to give you a wide range of benefits. The green haven recycles water, optimizes energy efficiency, conserves resources, generates less wastage and provides healthier environment. Recyclable materials are used including specially fabricated terra cotta blocks that boost and improve cooling properties. Sufficient power outlets and light points with modular switch of Clipsal / Legrand / Roma, etc.